When it comes to reducing its carbon footprint and implementing climate friendly energy solutions, the Danish island of Samso is a poster child. A world leader in sustainable energy, over the past decade Samso has transformed itself from being a fossil fuel importing island into an exporter of renewable energy. The island now produces more "green energy" than it consumes after developing a complex network of small and large wind turbines, solar PV panels, heat pumps, sustainable district heating systems and energy saving measures in both public and private buildings. The island's energy revolution has not gone unnoticed internationally. Each year, hundreds of so called 'eco-VIPs' from across the world come to the Samso Energy Academy. Soren Hermansen is the man behind it. Euronews' Hans von der Brelie met him in the Academy's futuristic looking building, a low energy construction with thick insulation topped with solar panels. Euronews: "You published very ambitious targets. Why aren't they being met completely?" Euronews: "How did you bring on board a majority of the local community when it comes to going green?" 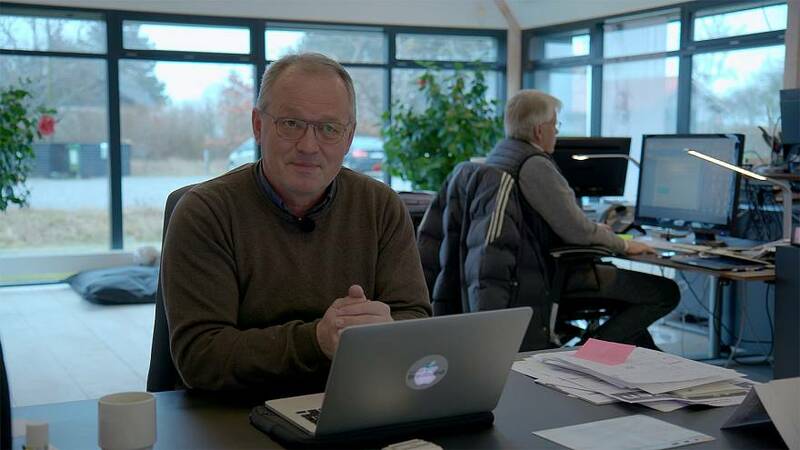 Soren Hermansen: "We have this approach that if the community not as a whole is participating, then we would create a lot of resistance against new technologies. Wo we have ensured that everybody, rich and poor, can participate in this (energy transition) by asking the banks to provide ownership documents. They banks gave loans to everyone who approached them, they just had to sign the ownership document. The banks keep the ownership document until the wind turbine or the solar panel has paid back the cost of the bank loan. (...) It is a kind of holistic feeling of ownership." Soren Hermansen: "The challenge of today is to meet the numbers. For energy savings, we have already met 20 to 30 percent energy conservation in houses, which is the lowest hanging fruit on the tree. If we climb a little higher it becomes more expensive per kw/h saved, even more insulation, even better windows... it is an extra investment we need to do here. (...) Regarding transportation: We still depend on ferries and trucks to deliver and to distribute goods and people want to travel around. We bought a new ferry, a 200 million Danish Kroner hybrid ferry to the mainland, which is running on LNG gas - which is a kind of forerunner of our own production of carbon free fuel in the future, biogas, methane... But the market price, the global market price on gas is low, which means that our production price is high (...). - Regarding electric cars, the population hesitates because of the capacity, the range of most electric cars is still below 200 kilometers and the electric cars are more expensive compared to similar cars with combustion engines. For me it is very hard to convince people to buy an electric car instead of a combustion engine with a high level of efficiency. (...) Regarding windpower, the capacity of windpower is going up today. Now we have one MW wind turbines, which people like, they are good. The next generation of wind turbines, if we want to repower, will be three times bigger or more. And then we go up in numbers again and the investment will be tremendous and we need to find a lot of other investors, because this kind of money is not here on the island. (...) - Regarding solar panels, we had a period where people were putting nice solar panels on their own roofs, but if you want to meet the UN development goals, you need to speed up capacity, which means on the field megasized solar panels covering many hectars of land... And again: We like the little PV plants, but the bigger PV plants are kind of challenging us, because they are spoiling the visual impact. (...) These are some of the problems we are struggling with to meet the ambitions of 2030." Euronews: "What about the legal framework needed, be it on an European, be it on a national level?" Soren Hermansen: "To make this work we need an European context, we need a very direct legal framework, we need to bonus the good stuff and to punish the bad stuff. In Denmark we had a high carbon tax for using fossil fuels. (...) This money was reinvested into green technologies. This is how you can finance the next infrastructure generation. (...) We need political help to do that. This is not for a local little market to handle that situation alone." Euronews: "What is the main problem, the main obstacle?" Soren Hermansen: "Low gas prices. (...) The threat is that the market will run us over and flatten us completely, because we can not compete gas prices from Putin or anybody else. (...) I live in a very beautiful community, we know each other, we shake hands, we meet, I can call anyone to come and to help me. We have a high social wealth here, we are socially a very strong little community. That is very important (...), so we can fight low gas prices, because if we only talk about market and economy then we get grumpy little narrow-minded people who do not believe that the community is valuable. (...) We want to fight for a greener community and I think the gas price will go up, the electricity price will go up too, that's everybody's prediction in the market and it will happen quite soon. So we need to be prepared for that."